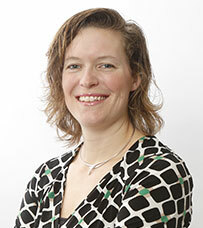 Naomi Duijvesteijn started her bachelor study Animal Sciences at Wageningen University in 2002. She continued with a Master study with the specialization Animal Breeding and Genetics. In 2009 she went five months to Uppsala, Sweden for an Erasmus Mundus exchange program to study molecular genetics at the SLU (Swedish University of Agricultural Sciences). In 2008 she went on a six month internship to LIC (a dairy breeding organization) in New Zealand to perform a QTL analysis on once-a-day milking. For her major thesis she performed a simulation study on the optimization of breeding programs for traits affected by social interactions in pigs. In January 2008 she finished her master after which she started working at TOPIGS Research Center IPG where she conducted several different studies for TOPIGS, a Dutch pig breeding organization. In March 2010 she combined work at TOPIGS Research Center IPG, with a PhD at the Animal Breeding and Genomics Centre (ABGC) at Wageningen University to investigate the prospects of including indirect genetic effects in pig breeding programs. This research was part of two larger research projects: “Genetics of social interactions in livestock: Improving health, welfare, and productivity in laying hens and pigs” and “Seeking sociable swine? Incorporating social genetic effects into pig breeding programs to achieve balanced improvement in productivity and welfare”. From September 2014 until September 2016, Naomi had a position as research manager at Topigs Norsvin, Beuningen, the Netherlands. From September onwards she moved with her family (partner and two daughters) to Armidale to start a postdoctoral research fellow with Professor Julius van der Werf in using sequence data to improve sheep breeding. PhD degree at Wageningen University (NL) in 2014 in Animal Breeding. Iversen, M. W., J. E. Bolhuis, I. Camerlink, W. W. Ursinus, I. Reimert and N. Duijvesteijn. 2016. Heritability of the backtest response in piglets and its genetic correlations with production traits. Animal, 1-8. Duijvesteijn, N., E.F. Knol and P. Bijma. 2014. Boar taint in entire male pigs: a GWAS for direct and indirect genetic effects on androstenone. Journal of Animal Science, 92(10):4319-4328. Duijvesteijn, N., M. Benard, I. Reimert and I. Camerlink. 2014. Same pig, different conclusions: stakeholders differ in Qualitative Behaviour Assessment. Journal of Agricultural and Environmental Ethics, 1-29. Duijvesteijn, N., J.M. Veltmaat, E.F. Knol and B. Harlizius. 2014. High-resolution association mapping of number of teats in pigs reveals regions controlling vertebral development. BMC Genomics, 12:542. Bosse. M. H.J. Megens, L.A.F. Frantz, O. Madsen, G. Larson, Y. Paudel, N. Duijvesteijn, B. Harlizius, Y. Hagemeijer, R.P.M.A. Crooijmans and M.A.M. Groenen. 2014. Genomic analysis reveals selection for Asian genes in European pigs following human-mediated introgression. Nature Communications, 5. Camerlink, I., J.E. Bolhuis, N. Duijvesteijn, J.A.M. van Arendonk and P. Bijma. 2014. Growth performance and carcass traits in pigs selected for indirect genetic effects on growth rate in two environments. Journal of Animal Science, 92(6): 2612-2619. Reimert, I., T. B. Rodenburg, W. W. Ursinus, N. Duijvesteijn, I. Camerlink, B. Kemp and J. E. Bolhuis. 2013. Backtest and novelty behavior of female and castrated male piglets, with diverging social breeding values for growth. Journal of Animal Science, 91(10): 4589-4597. Lopes, M. S., F. F. Silva, B. Harlizius, N. Duijvesteijn, P. S. Lopes, S. E. Guimarães, and E. F. Knol. 2013. Improved estimation of inbreeding and kinship in pigs using optimized SNP panels. BMC Genetics, 14: 92. Duijvesteijn, N., E. F. Knol, and P. Bijma. 2012. Direct and associative effects for androstenone and genetic correlations with backfat and growth in entire male pigs. Journal of Animal Science, 90(8): 2465-2475. Duijvesteijn, N., A.M. Ramos, E.F. Knol. J.W.M. Merks, R.P.M.A Crooijmans, M.A.M Groenen, H. Bovenhuis and B. Harlizius. 2011. The distal end of porcine chromosome 6p is involved in the regulation of skatole levels in boars. BMC Genetics, 12:35. Harlizius, B., M.S. Lopes, N. Duijvesteijn, E.F. Knol, J.W.M Merks, H. Bovenhuis, L.H.P. van de Goor, W.A. van Haeringen, H. Panneman, S.E.F. Guimarães, J.W.M. Merks, and E.F. Knol. 2011. A single nucleotide polymorphism set for paternal identification to reduce the costs of trait recording in commercial pig breeding. Journal of Animal Science, 89(6):1661-1668. Duijvesteijn, N., E.F. Knol. J.W.M. Merks, R.P.M.A Crooijmans, M.A.M Groenen, H. Bovenhuis and B. Harlizius. 2010. A genome-wide association study on androstenone levels in pigs reveals a cluster of candidate genes on chromosome 6. BMC Genetics, 11:42. Bouwman, A.C., R. Bergsma, N. Duijvesteijn and P. Bijma. 2010. Maternal and social genetic effects on average daily gain of piglets from birth until weaning. Journal of Animal Science, 88(9):2883-2892.